Microarrays have been applied to the determination of genome-wide expression patterns during the cell cycle of a number of different cells. Both eukaryotic and prokaryotic cells have been studied using whole-culture and selective synchronization methods. The published microarray data on yeast, mammalian, and bacterial cells have been uniformly interpreted as indicating that a large number of genes are expressed in a cell-cycle-dependent manner. These conclusions are reconsidered using explicit criteria for synchronization and precise criteria for identifying gene expression patterns during the cell cycle. The conclusions regarding cell-cycle-dependent gene expression based on microarray analysis are weakened by arguably problematic choices for synchronization methodology (e.g., whole-culture methods that do not synchronize cells) and questionable statistical rigor for identifying cell-cycle-dependent gene expression. Because of the uncertainties in synchrony methodology, as well as uncertainties in microarray analysis, one should be somewhat skeptical of claims that there are a large number of genes expressed in a cell-cycle-dependent manner. Classical experimental methods have led to the widely held belief that many genes are expressed in a cell-cycle-specific manner. Microarrays have now been utilized to study the global extent of cycle-specific gene expression in eukaryotes and prokaryotes in order to obtain a complete picture of the pattern of gene expression between the birth of a cell and a subsequent division. A number of groups have studied gene expression during the division cycle by synchronizing cells, removing cells at different times following the initiation of synchronous growth, and analyzing the mRNA contents of these cells using microarray technology. Periodic variations in mRNA concentration, coincident with the length of the cell cycle, are taken as an indication that a particular gene is regulated as a function of the cell cycle. In addition to the pre-existing experimental basis for the expectation that a large number of genes would be regulated in a cell-cycle-specific manner, it has also been suggested that cell-cycle-dependent regulatory systems are an efficient way for the cell to organize gene expression . Producing gene products (i.e., mRNAs, enzymes, proteins) primarily when they are used or needed would be a better utilization of resources; that is, resources are not made until they are required for use. We now review the recent spate of microarray experiments on gene expression from a variety of eukaryotic and prokaryotic systems. Two important groups of criteria must be satisfied to have a successful synchrony/microarray experiment. First, the cells must be synchronized. Second, there must be a method that is able to pick out of the mass of data points those genes that exhibit a periodic expression pattern reflecting gene expression during the normal division cycle. By "normal" we refer to an unperturbed cell growing in unlimited medium and dividing to produce two daughter cells each then repeating the cell cycle. It is widely believed that there are numerous whole-culture methods that can arrest cells at particular points in the cell cycle. Whole-culture methods (also called "batch" methods or "forcing" methods) are those that take an entire culture of growing cells, and produce a synchronized culture from all cells. The use of whole-culture methods for synchronization has been challenged on theoretical [2–7] and experimental grounds [8–11]. In summary, it is proposed that whole-culture methods cannot synchronize cells. These whole-culture methods may align cells so that cells exhibit a common property (e.g., all cells have a similar DNA content). But such an alignment does not mean these cells are arrested at a particular cell age nor does it mean that the cells released from this alignment are synchronized. In addition to synchronization problems, identifying cyclical gene expression is difficult because of the large amount of data produced by microarray experiments. When a large number of genes are analyzed (sometimes up to 40,000 sequences can be studied in a single experiment), it is expected that some cyclical patterns will be found merely as a result of random noise and experimental variation . Statistical analysis must be used in order to glean biologically significant results. Merely finding that a gene is cyclically expressed in a small number of experiments is insufficient to demonstrate that the gene will exhibit a reproducible cyclicity of its expression in normal, unperturbed cell growth. One problem with microarray analysis is that the expense of the method leads to major conclusions that are based on few replicate experiments. Sometimes only one experiment is performed. This absence of evidence of reproducibility of results makes it difficult to evaluate the conclusions of some experiments. Both the synchrony and microarray aspects of cell-cycle experiments must be considered in order to decide that a particular experiment satisfies rigorous criteria for a well-performed experiment. For synchronized cells (i.e., cells that are cell-cycle-age aligned and are expected to pass through the cell cycle as a unified and coherent cohort) the synchronization method should actually synchronize the cells. Criteria for synchronization are listed in Appendix 1 [additional file 1]. Fig. 1 is a diagrammatic illustration of some of the relevant criteria. Once cells are synchronized, gene expression measurements as the cells pass through the cell cycle should yield reliable data that satisfy rigorous statistical tests (Appendix 2 [additional file 2]). Illustration of places for application of criteria for synchronization. Numbers refer to criteria in list in Appendix 1 [see additional file 1]. 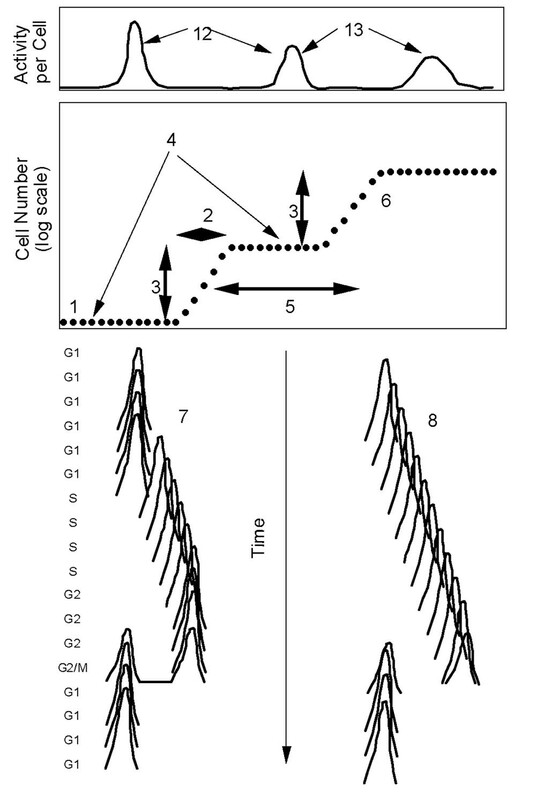 The top box is an activity/cell graph, the lower box is a synchrony curve, and below the synchrony curve are DNA content (left) and size analyses (right) of synchronized cells. Note that the expression of a cycle-dependent gene should peak at the same part of the cell cycle in successive cell cycles. Also, the DNA content should progress as expected through the cell cycle and repeat in the second cycle. The cell size of synchronized cells should have a distribution that is significantly narrower than the unsynchronized, original culture. Part of the impetus for this analysis of microarray experiments (besides the desire to summarize a rapidly growing field of experimental endeavor) is a model of the cell cycle that takes issue with the current and dominant view of cell-cycle control. This alternative view of the cell cycle takes issue with such well-accepted ideas as the existence of a G0 phase, G1-phase arrest points, the restriction point, G1-phase specifically expressed genes, and related aspects of cell-cycle progression [2–4, 6, 7, 9, 13–21]. Most important for the analysis of synchronization experiments, this alternative view takes issue with the ability of whole-culture methods to synchronize cells. The dominant approach to cell synchronization is to starve or inhibit all the cells in a culture cells to "arrest" cells at a particular point in the cell cycle. This whole-culture synchronization of an exponential culture is believed to produce a cohort of cells that all have or reflect a common cell age. If one could starve or inhibit cells and arrest cells at a particular cell age, then release of these arrested cells would lead to synchronized growth as cells move from the arrest point through the cell cycle. Despite hundreds or even thousands of papers that use whole-culture methods to synchronize cells, available evidence [8–11] and theoretical considerations [2–7] indicate that these methods cannot synchronize cells. We will point out where whole-culture synchronization has been used. More important, we will note when evidence of synchronization is present and when it is absent, and also when the evidence indicates cells are not synchronized. In addition to the proposal that whole-culture synchronization does not synchronize cells, there is the ever-present problem of introducing perturbations and artifacts that will obscure the normal pattern of gene expression during the cell cycle. What do we mean by "artifacts"? Let us consider a Gedanken experiment where we are given a cell that specifically did not have any cell-cycle-specifically-expressed genes. If following a synchronization experiment cycle-dependent patterns were found, we would describe those patterns as artifacticious products of the synchronization method. These cyclic patterns would not reflect the "normal" cell cycle as defined above. Many papers on gene expression during the cell cycle explicitly express the expectation that there exist a large number of cyclically expressed genes. Therefore, when numerous cyclicities are found, this is taken as a confirmation of the original premise. However, if artifacts are introduced by the synchronization methodology, observed cyclicities will not support the proposal that there are cyclically-expressed genes. Merely finding periodicities after a proposed "synchronization" procedure does not mean that an observed cyclical gene expression pattern accurately reflects the normal pattern of gene expression. Neither does this cyclicity prove that the cells were synchronized. • The theoretical arguments against whole-culture synchronization approaches have never been answered or refuted. • The experimental critiques against whole-culture synchronization have not been answered or refuted. • A minority viewpoint may very well be the correct viewpoint, as scientific truth is not determined by majority vote. • It is not argued that synchronization is not possible; it is argued that only by selective methods can one get a truly synchronized culture (see next section). • The criteria listed in Appendix 1 are rarely considered when synchronization methods are used or proposed. While these criteria may be rigorous, we feel that precise and formalized criteria to determine whether a method has truly synchronized a group of cells are to be preferred to flexible and ad hoc criteria. Selective synchronization methods are those methods where a subset of cells – with a narrow cell-age distribution – are removed from a growing culture. These selected cells, in theory and occasionally in practice, can produce a synchronized culture. Some studies have used selective methods such as mitotic shake-off to produce a synchronized culture. In theory this approach can produce a synchronized culture. But in practice the synchrony (for eukaryotic cells) is neither sharp nor clear. In one published example  the rise time for initiation of S phase in such mitotically selected cells is spread over 10 hours. Elutriation and other hydrodynamic methods have been used to select cells of a particular "size". It is believed that such a selection can produce cells of a particular cell-cycle age and thus produce a synchronized culture. But hydrodynamic methods select cells on the basis of sedimentation coefficient. The sedimentation coefficient is dependent on both size and shape. A large-sized cell with a diffuse shape may be selected along with small-sized cells of compact shape as they could both have the same sedimentation coefficient. Thus it is not clear that such physical methods of cell separation can lead to a well-synchronized culture. While elutriated cells may have a uniform DNA content, it is not clear that these cells divide so synchronously as to provide an adequate synchronized culture (see Appendix 1). The recent development of a eukaryotic membrane-elution system ("baby-machine") has now produced a new "gold standard" against which other methods can be judged (See Appendix 1 for synchronization criteria). Newborn cells eluted from the membrane-elution apparatus exhibit at least three well-defined cell cycles whose length is equivalent to the doubling time of growing cells. The rise time during division is very short. Furthermore, these eluted cells show the proper DNA contents as well as the expected cell size distributions during three cycles of synchronous growth. Most important, these eluted cells were never subjected to any perturbing influences [8, 23, 24]. In comparison with mitotic selection methods, the cells eluted from the membrane-elution apparatus have a rise time for the period of cell division of approximately two hours. In comparison with this new "gold standard" for synchronization, we see that even mitotically selected cells have only a modest synchrony. The reason for the success of membrane-elution is that cells are selected for precisely the property desired; cells are selected at their time of birth, and all cells thus have the same initial cell-cycle age. The experiments described below have a common and simple approach. Cells are synchronized by a variety of procedures depending on cell type and available methods. The synchronized cells are sampled at various times during the presumed passage through the cell cycle. Gene expression is then analyzed by large-scale microarray systems that measure the relative or absolute concentration of individual mRNA species. The microarray data are then analyzed using either visual or statistical methods (see Appendix 2 in order to determine which genes are expressed in a periodic fashion during passage through the cell cycle. The paper by Spellman et al. , the most prominent and well-known large-scale analysis of gene expression during the cell cycle, sets the tone for the entire field. Cells were proposed to be synchronized using three whole-culture methods (α-factor arrest, temperature arrest of two temperature-sensitive mutants) and one selective method (elutriation). The theoretically satisfactory elutriation method was run for only one cycle (small cells were selected by elutriation and allowed to grow out after selection), so it is difficult to judge the synchrony obtained by this method. (An earlier report  on microarray analysis of the yeast cell cycle studied cells aligned using temperature arrest of a temperature sensitive mutant of yeast; these results have been incorporated into the more extensive analysis of Spellman et al. .) Synchronous growth was monitored in various experiments by bud count, FACS analysis, and nuclear staining. The data presented were not adequate to judge the quality of the synchrony. In particular, synchronized divisions were not described. A large number of genes (~800) were identified as giving a cell-cycle-specific pattern of gene expression. For a given gene in each of the four experiments cyclicities are characterized in terms of an aggregate score based on (1) the fit of the experimental data for the given gene to a sine wave used as a surrogate pattern of ideal cyclicity, and (2) the correlation between the experimental data for a given gene and the experimental data for other genes considered to be confirmed cell-cycle regulated genes (see Appendix 2). These cyclicity scores are then summed across three experiments (elutriation was excluded) to give an overall cyclicity score to identify genes expressed periodically during the division cycle. In the earlier work of Cho et al. , cyclicities were determined by visual study of the gene expression patterns. No sharp cut-off between cyclical genes and non-cyclical genes was observed by Spellman et al. . The threshold for cyclicity assignment was determined after the analysis by lowering the threshold to incorporate within the cyclic gene population 94% of those genes that were previously proposed – using classical assay methods – to be expressed in a cyclical manner. Thus, a confirmation of the microarray results identifying cyclically expressed genes by referring to the high-percentage of "known" cyclical genes found within that category is really subject to the criticism that it is circular reasoning. This critique is supported by the presence of genes with cyclicities above the cyclicity threshold that were neither shown to be cyclical by previous work nor expected to be expressed in a cell-cycle-dependent pattern. It could be argued that the threshold should be raised in this case in order to exclude, as much as possible, those "false-positive" genes. In addition to the absence of a sharp divide between the cyclical and non-cyclical genes, there is a continuum of phase or timing of expression. There is no sharp demarcation between those genes with peak expression in the G1, S, G2, or M phases. Assignment to various cycle phases is therefore mildly arbitrary. A statistical reanalysis of the original yeast data indicated that although the observed cyclicities are not totally accountable by random noise and experimental variation, the cyclicity values (measured as a fit to a sine wave) are only weakly reproducible across experiments . For the whole-culture synchronization methods the phase location has more reproducibility, but this may be the result of a common response of particular genes to the perturbing affects of the whole-culture synchronization methodologies . This is because the elutriation results for time of peak expression do not correlate with the whole-culture methods. The yeast data seem to have a Lorelei effect on other groups, who are attracted to the data for their own analyses. Some of the analyses may be valid within the limitation that these data are produced by whole-culture synchronization methodology. Thus a classification of genes according to their response patterns to a particular "synchronization" treatment may yield interesting classes of genes. But a successful classification scheme does not ensure that the expression patterns are present in the normal, unperturbed, cell cycle. One indication that the whole-culture methods may perturb cells is the observation that the yeast elutriation experiment, one that may be considered the least perturbing, is substantially different from the other experiments . Here we briefly note some of the more salient post-publication analyses of the yeast data. The data on the yeast cell cycle from Spellman et al. have been analyzed in a number of different ways, including: visual inspection , Fourier transformation , self-organizing maps , k-means clustering , single-pulse modeling , QT-clustering , singular value decomposition [31, 32], correspondence analysis , and wavelet analysis . A reanalysis of the yeast data using time warping algorithms applicable to RNA and protein expression data demonstrated their applicability to the yeast RNA expression time series . In addition to two warping algorithms, a simple warping algorithm and an interpolative algorithm were presented along with programs that generate graphics that visually present alignment information . Time warping was proposed to be superior to simple clustering. Suffice it to say that whatever results are obtained by these alternative approaches, the interpretation, applicability, and acceptance of the results depends on one's evaluation of the synchronization and microarray methods. If the cells are not synchronized, but merely perturbed, then the analyses may reveal facts related to the perturbation and its aftermath. Thus, a clustering analysis may cluster genes with regard to similarity of response to the particular synchronization methodology used, rather than to passage of cells through the normal cell cycle. A computer based search for cyclicity using the three whole-culture synchronization data sets indicated that only 42 genes could be scored as cyclic based on all three data sets . This is out of a total of 367 genes that were identified as cyclic in at least one data set. Other genes were cyclic in two sets, and 220 (more than half of all cyclical genes) were found to be cyclical in only one experimental data set. Similar results have been found using visual comparison graphs . One particular analysis deserves special attention. Tavazoie et al. grouped genes according to function and showed that gene groups with similar function had similar patterns of gene expression during the cell cycle. This result suggested that the yeast data were relevant to the normal cell cycle. But in addition to genes that gave reproducing patterns over two cycles, a number of other gene groups showed a lack of repetition over two cycles. Some had a peak in the first cycle, and no peak in the second cycle. Others were high in the first and low in the second, or low in the first and high in the second. Similar problems with results not reproducing over two successive cycles were noted  for the data of Cho et al. . Non-reproducing patterns of gene expression in two successive cell cycles is prima facie evidence that the yeast data (or any other data) is affected by perturbations. Primary fibroblasts were synchronized using a double-thymidine block. Messenger RNA samples were isolated from cells every two hours for 24 hours, covering two cell cycles. The isolated mRNA was labeled with a fluorescent marker and hybridized to microarrays containing probes for 7129 genes. Two replicate experiments were performed. Cyclical genes were identified by fitting the expression data to an idealized sine wave . In addition to correlations to a sine wave, correlations to reputed "known" cyclically expressed genes were used to identify additional genes with cell-cycle-dependent expression patterns. The primary result was the identification of 387 cell-cycle-regulated genes. From a larger set of 40,000 transcripts, it was noted that 731 transcripts were assigned to cell-cycle-regulated expression clusters; the smaller number relates to those that were assigned to different cell-cycle phases using a smaller Affymetrix chip. The putative cyclic genes were identified by searching among the expression patterns for those that fit a sine wave pattern above a particular threshold over the two cell cycles. Based on two replicate experiments, 53 genes were described as being G1-phase specific, 107 as S-phase specific, 108 as G2-phase specific, and 119 as M-phase specific. A plot of all proposed cell-cycle-specific genes revealed that the times of peak expression varied continuously and smoothly during the division cycle making the assignment of peak expression to a particular phase somewhat arbitrary. Nevertheless, the primary conclusion from the microarray analysis of these whole-culture synchronized human fibroblast cells is that there exist mammalian (human) genes that are expressed specifically in each phase of the cell cycle. A statistical re-analysis of the original fibroblast data  produced three principal findings. (i) Randomized data exhibit periodic patterns of similar or greater strength than the experimental data. This suggests that all apparent cyclicities in the expression measurements may be due to chance fluctuations and experimental variation. (ii) The presence of cyclicity and the timing of peak cyclicity in a given gene are not reproduced in two replicate experiments. This suggests that there is an uncontrolled source of experimental variation that is stronger than the innate variation of gene expression in cells over time. (iii) The amplitude of peak expression in the second cycle is not consistently smaller than the corresponding amplitude in the first cycle. This finding indicates that the cells treated to the whole-culture, double-thymidine block are not synchronized. It was concluded that the microarray results on the primary fibroblasts do not support the proposal that there are numerous cell-cycle-dependent genes in human cells . Besides the critique of the primary fibroblast data on the basis of questionable synchronization methods, and the absence of reproducibility in the microarray results, it is important to point out that the use of primary, uncloned cells in this experiment raises serious questions. The tissues that gave rise to the primary fibroblasts are very likely composed of cells of different types and different histories. Thus, the results may not be due to any particular single cell type. This lack of uniformity of cell type would also argue against simple synchronization of these cells by the double-thymidine block. Two different time course analyses of cycle-related gene expression in HeLa cells have been carried out. In addition, a two-point analysis of HeLa cells has been described. The use of a cloned cell line such as HeLa cells avoids the problem of a possible mixture of cell types being present as in the analysis of primary human fibroblasts. In one study , two whole-culture methods (a double-thymidine block and a thymidine/nocodazole treatment) and one selective method (elutriation) were used to produce synchronized cells. FACS analyses of the two whole-culture methods clearly indicated, despite claims of synchronization, that the cells were neither synchronized nor unperturbed. The initial cells have a DNA concentration above that of cells in subsequent cycles, and there is no consistent pattern of cells moving as a uniform cohort through the cell cycle. A comparison with membrane-eluted cells [8, 23, 24] indicates most clearly that the Hela cells are not synchronized. For instance, there are no clear patterns of cellular DNA contents reflecting the passage of these cells through discrete cell cycles. Mitotic selection synchronization, a selective method, produced a culture with a very broad rise-time of initiation of DNA replication. It is possible that the spread in division times may be even broader due to the accumulation of variation following initiation of DNA replication. We suggest that these cells, while theoretically synchronized, are not really suitable for the analysis of gene expression during the cell cycle as any potential cycle-related pattern would be lost due to the spread in synchronized growth. The genome-wide program of gene expression during the HeLa division cycle  was characterized using cDNA microarrays. Transcripts of more than 850 genes showed periodic variation during the cell cycle. Hierarchical clustering of the expression patterns revealed co-expressed groups of previously well-characterized genes involved in essential cell-cycle processes such as DNA replication, chromosome segregation, and cell adhesion along with genes of uncharacterized function. An independent analysis of HeLa cells was performed using a GeneChip with over 7,000 human genes . HeLa cells were synchronized at the beginning of S-phase by thymidine/aphidicolin block, and RNA populations were analyzed throughout the S and G2 phases. Expression of genes involved in DNA replication is maximal during early S-phase, whereas histone mRNAs peak at mid S-phase. Genes related to cell proliferation, including those encoding cyclins, oncoproteins, growth factors, proteins involved in signal transduction, and DNA repair proteins, followed distinct temporal patterns of expression that are functionally linked to initiation of DNA replication and progression through S-phase. The timing of expression for many genes in tumor-derived HeLa cells is highly conserved when compared with normal cells. In contrast, a number of genes show growth phenotype-related expression patterns that may directly reflect loss of stringent growth control in tumor cells. As with the HeLa cell experiments described above  the synchrony of the cells was monitored by FACS analysis. This FACS analysis clearly shows that the cells were not synchronized. After nine hours the cells return to the normal, unsynchronized pattern and there is no second cycle apparent in the data . This result is another experimental indication of why it is incorrect to assume that cells with a common DNA content are cells of the same age and the progenitors of a synchronized culture. One of the hallmarks of reliability of an analysis is the reproducibility of results in different laboratories. A comparison of the HeLa results  with the analysis of primary fibroblasts  indicated that on the order of only 15% of the cyclic genes identified in one study were also found to be cyclic in the other study . This low level of reproducibility should caution one to the use of these studies to identify genes expressed in a cell-cycle-dependent manner. A simplified approach to cell-cycle analysis was performed by studying cells arrested with a G1-phase amount of DNA and a G2-phase amount of DNA . GeneChip microarrays of oligonucleotides corresponding to over 12,000 human genes were employed to profile differential gene expression in G1 and G2. The data from three independent experiments were filtered and a set of genes was compiled based on at least threefold-altered expression in all three experiments. This analysis identified 154 genes that were elevated in G2 phase of cells as compared to early G1 phase including 15 novel genes. This number included mRNAs whose increase is known to occur in G2 phase. Only 19 genes were increased in G1 phase; among these genes, six genes were novel. As with the two other HeLa cell experiments described above, the use of whole-culture synchronization methods suggest that whatever results were obtained are not related to the cell cycle. Merely arresting cells at mitosis (nocodazole) or at the initiation of S phase (thymidine/aphidicolin block) and allowing outgrowth of these cells so that a significant number of cells are found either with a G2-phase amount of DNA (after the G1/S block) or a G1-phase amount of DNA (after release from mitotic block) does not mean that these cells are representative of either G1- or G2-phase cells in a normal, growing cell culture. Furthermore, it is far from clear that the 19 genes found to give G1-phase specific expression out of the 12,000 genes analyzed are not accountable by random noise and experimental variation. Mouse embryo fibroblasts were analyzed using two whole-culture methods for synchronization, serum starvation (see below for a comment on this method) and hydroxyurea inhibition that is believed to arrest cells at the G1/S phase border . Comparison of different patterns of expression from the two methods could presumably lead to a distinction between those genes activated by a change in growth conditions (low serum to high serum) from those related to passage through the cell cycle (release of G1/S arrested cells). As noted above, the use of whole-culture methods for synchronization is a fundamental problem. Cluster analysis did identify seven distinct clusters of genes that exhibit unique patterns of expression, but it is difficult to distinguish these clusters as reflecting a cell-cycle pattern from expression patterns resulting merely from the synchronizing treatment. Although it is proposed that genes tend to cluster within these groups based on common function and the time during the cell cycle that the activity is required, numerous genes do not fit this criterion. Thus, this post hoc analysis of the timing of gene expression could also be used to say that genes are made independently of their particular function and time of use. It is possible to grow plant cells in culture. Treatment of Arabidopsis cells with aphidicolin  was used to synchronize cells. The relative RNA content from sequential samples of Arabidopsis cells progressing through the cell cycle was analyzed using Affymetrix Gene arrays . Cyclicity was determined by a fit to a sine wave, and it was shown that the results were not due to statistical variation or random variation using previously described methods (Appendix 2) [10, 11]. Using this methodology, 493 genes were selected as having a high probability of exhibiting significant regulation during the duration of the experiment. Nearly 500 genes were identified that robustly display significant fluctuation in expression. In addition to the limited number of genes previously identified as cell-cycle-regulated in plants, specific patterns of regulation for genes known or suspected to be involved in signal transduction, transcriptional regulation, and hormonal regulation, including key genes of cytokinin response were found. Genes identified represent pathways that are cell cycle-regulated in other organisms and those involved in plant-specific processes. As with the mammalian and yeast cell experiments, the use of whole-culture synchronization makes it difficult to evaluate the proposed cell-cycle-specific patterns of gene expression in these plant cells. The most common experimental approach to cell-cycle study is to arrest cell growth using incubation in low-serum medium. It is generally accepted that such a treatment produces cells arrested at a point in the G1 phase (the restriction point or similar points) or arrested in an out-of-cycle phase termed G0 [3, 4, 6]. Adding elevated serum to these growth-arrested cells is proposed to produce a synchronized culture or to return cells to the cell cycle for synchronized growth. This synchronization method has been severely criticized [3, 4, 6]. Therefore it is most interesting that a study of serum-stimulated cells using microarrays  actually steered clear of the cell-cycle analysis in favor of interpreting the results in terms of a temporal program of gene expression during a model physiological response of human cells to serum. Thus, primary human fibroblasts incubated for 48 hours in low serum and then stimulated with 10% serum were analyzed with a complementary DNA microarray representing about 8600 different human genes. Genes could be clustered into groups on the basis of their temporal patterns of expression in this program. Many features of the transcriptional program appeared to be related to the physiology of wound repair, suggesting that fibroblasts play a larger and richer role in this complex multicellular response than had previously been appreciated . Although the results were not interpreted as a cell-cycle response to recovery of cells from serum starvation, the co-expression analysis of this data is still valid as a reflection of gene expression following starvation and refeeding of serum. This study is to be commended for refraining from cell cycle analysis and for looking objectively at the microarray results as a response to a treatment rather than as a study of synchronized cells. Microarray analysis of the prokaryote, Caulobacter crescentus, led to the conclusion that 533 genes varied during the cell cycle . Because of the growth pattern of Caulobacter, these cells may be considered the most well-synchronized cells of those considered here. This bacterium grows attached to a substrate by an appendage, the holdfast. When a cell divides it releases a motile cell with a flagellum. It is a simple matter to get a synchronized culture merely by harvesting these motile swarmer cells that were produced over a short period of time. Although the division cycle of the swarmer cells is only 150 minutes, a significant number of genes exhibited cell-cycle-specific expression. Cyclicity was determined by analyzing the data with a discrete cosine transform algorithm that is equivalent to the Fourier analysis. The Caulobacter growth pattern during its cell cycle, along with the yeast results, were the basis for the expectation that there would be a numerous genes expressed in a cell-cycle-specific manner. It was the generality of the finding between both eukaryotic and prokaryotic cells that led to this proposal. However, contrary evidence exists, as a prokaryote such as Escherichia coli does not exhibit measurable cycle-specific gene expression . On a theoretical level, one must consider balancing the informational and energetic requirements to have cycle-specific control elements against the possible costs of these control systems. Just as a cycle-specific pattern could be justified because of the efficient use of resources, it could equally be argued that the energy or informational requirements to maintain this system are not worth the result. An alternative view of the Caulobacter cell cycle  leads to the proposal of an alternative interpretation of the observed cyclical patterns of gene expression in this prokaryotic cell. Consider that upon the cell division that follows the earlier period of DNA replication the newly formed pole is not complete. This new pole is then completed during the middle of the next division cycle . If the completion of the pole leads to the induction of specific genes (e.g., flagellin genes) then it would appear as if there were cell-cycle-regulated genes in this organism when the proper conclusion is that the completion of a pole occurs during the middle of the subsequent division cycle. At a more anthropomorphic level of analysis (admittedly a questionable approach), it is difficult to understand how, over a relatively short cell-cycle time (150 minutes), the cyclical expression of 533 genes could truly be related to the control of events during the cell cycle. The spread of expression values would argue against these patterns of gene expression having any controlling function. Of course, it might be that within an individual cell the gene-expression pattern is extremely precise with regard to the execution of specific sequential events during the cell cycle. In many of the papers reviewed here, after a number of genes are identified as being cell-cycle-specific in their expression, it is pointed out that previous work, using more classical methods (e.g., northern blots) have also identified the same gene. This repetition is taken as support that the results obtained truly reflect cell-cycle-specific expression. This conclusion must be tempered by the fact that the prior result may be obtained using the same type of synchronization methodology. If this were the case, the similar results could be due to similar perturbations in both the original and the microarray experiment. For example, if α-factor arrest is used to "synchronize" yeast cells in the classical measurement, and the same synchrony method is used in the microarray approach, the confirmation of a gene expression pattern merely confirms that the microarray can mimic the prior classical result. The same argument holds for using extremely quantitative methods (e.g., real time PCR analysis) to measure and confirm mRNA contents. It is possible to show that the microarray measures mRNA correctly, but this does not eliminate the problems of perturbations, artifacts, or lack of synchronization. Essentially all of the methods used for the studies on cell-cycle-dependent gene expression used starvation or inhibition methods to synchronize cells. It has been proposed that it is theoretically impossible to synchronize cells by any whole-culture method [3, 6, 20]. Here we briefly review the theoretical argument against whole-culture synchronization and follow with a short review of the experimental work demonstrating that whole-culture synchronization methods do not work. If the whole-culture methods do not synchronize cells, then any results regarding cell-cycle control that are derived from these experiments must be re-examined. The argument that whole-culture methods do not synchronize cells is simple [3, 6, 7, 15, 18, 20]. Exponentially growing cells have varied DNA contents and varied cell sizes. Cell size varies over a factor of at least two, as the newborn cells are half the size of the dividing cells. Cells of intermediate cell-cycle ages have intermediate sizes. To produce a synchronized culture, one must align cells so their DNA content is uniform. There must also be a narrowing of cell size so the initial cells are similar to the size of cells at some particular cell age. The cells in a synchronized culture must exhibit both the DNA content and the size of a particular cell age during the normal, unperturbed cell cycle. A detailed analysis of the three fundamental classes of synchronization methods, arrest of mass growth, arrest of DNA replication, and arrest of mitosis, indicate that none of these methods, in theory, can lead to a truly synchronized culture . The inability of whole-culture methods to synchronize cells results from the fact that none of these methods produce a narrowing of cell-size distribution. Because inhibition of mass increase does not lead to cells stopping growth at a particular cell size, and because inhibition of DNA synthesis or mitosis does not arrest mass increase, there is no narrowing of cell size distributions. We are not proposing that whole-culture methods do not produce "adequate" synchronization. Cells are either synchronized or not, and even poor synchronization can be called synchronization. To be clear, we propose that whole culture methods do not synchronize cells at all. Why must the initial cells of a synchronized culture have a narrow cell size distribution reflecting some cell-cycle age during unrestricted growth? There are two answers to this question. Assume that there is a progression of events during the cell cycle, and that these events occur at different cell ages and thus at different cell sizes. If the size distribution is not narrowed, the initial cells after whole-culture treatment are in different parts of the progression of cell-cycle events – even though they may all have a common DNA content. Alternatively, assume that growing cells initiate DNA replication at some cell-cycle age and at some particular cell size. If achievement of a certain cell size is a critical control system, then a group of cells with a narrow set of DNA contents but varied cell sizes will reach the initiation size at different times. This leads to an absence of synchrony. Theoretical arguments against synchronization by whole-culture methods have been strongly supported by much experimental evidence. A reanalysis of the whole-culture synchronization of mammalian cells  showed that the evidence for synchronization actually indicated that the cells were not synchronized . An analysis  of microarray studies of cells synchronized by a double-thymidine block  indicated that the cells were, in fact, not synchronized. A demonstration of the lack of synchronization of cells by a whole-culture treatment is the time-lapse, videographic, analysis of cells treated with lovastatin . In contrast to the proposal that lovastatin is a synchronizing agent  it was shown by direct examination of cell division patterns that cells are not synchronized by lovastatin treatment . This finding is consistent with previous results as a reanalysis of the original data on lovastatin inhibition and synchronization  suggested that the original data on synchronization  was consistent with a lack of synchrony. In addition, data showing that lovastatin-treated cells are arrested in the G1-phase of the cell cycle [49, 50] has been reinterpreted, with the conclusion that the cells were not actually arrested in any particular phase of the cell cycle . Other laboratories have also presented data that indicate that there is no synchronization using lovastatin . Experiments studying cells placed in a "G0 phase" from which cells are proposed to emerge as a synchronized cohort [52–54], actually support the idea that such cells are not synchronized [14, 15, 18]. Furthermore, a study of the cell synchronization agents compactin, ciclopiroxolamine, mimosine, aphidicolin, ALLN, and colcemid indicated that it was not clear that the methods actually synchronized cells . It was concluded that the experiments demonstrated that whole-culture synchrony methods differ with respect to their impact on cell-cycle organization and do not synchronize cells . Finally, and perhaps most strikingly, the original work on restriction point arrest [56, 57], the classic ancestor of all arrest methods for synchronization, supports the suggestion that cells are neither arrested at a particular point in the G1 phase nor synchronized after release . An explicit set of criteria for a synchronized culture and a cell-cycle experiment is presented in Appendix 1. A synchronized culture is one that truly mimics the division cycle of a normal growing cell. It is not correct to term a culture synchronized merely because all cells may have a particular common property, for example, a G1-amount of DNA. Such cells may be "aligned" with a G1-phase amount of DNA, but are not necessarily synchronized . Cells that are "aligned" with a particular property must be distinguished from cells that are "synchronized". Synchronized cells truly and accurately reproduce the events during the division cycle of normal, unsynchronized, exponentially growing cells. One of the main criteria for defining a well-synchronized culture is that the cells should divide "synchronously." Such an idea seems self-evident. In fact we propose a ukase that synchronous division be the sine qua non of synchronization. But there is hardly any synchrony method used with mammalian cells where this criterion has been satisfied. This is probably because it is so labor intensive to study the division pattern of a "synchronized" culture. However, this criterion is well satisfied by the cells eluted from the membrane-elution apparatus [8, 23, 24]. What is the object of cell-cycle studies? The object of cell-cycle analysis is to understand the cell cycle of a cell growing in an invariant environment, and passing through the identified phases of the cell cycle (G1, S, G2, M) solely due to internal changes. A single unperturbed cell, growing in a vast volume of unlimited medium so as not to sense any growth limitations on passage through the cell cycle, is the object of this study. From this perspective, the use of synchronization and other experimental manipulations to produce cells exhibiting properties associated with one or another of the cell-cycle phases is merely a necessary evil that must be tolerated because the chemical analysis of a single cell is not possible. One of the main benefits of microarrays – the ability to study numerous genes at the same time – may also be one of its largest problems. Because a large number of genes are assayed at the same time, it is possible to observe cyclicity arising merely from slight statistical variations due to random noise and experimental variations in the assay procedure. These cyclicities would have no real existence relative to the cell cycle. For this reason it is important to compare the experimental results with a randomized set of data derived from the original values (Appendix 2). If the randomized set can give as many cyclicities as the experimental set, then the variation in the data can be ascribed to experimental noise and biological variation unrelated to the cell cycle [10, 11]. Lest it be thought that the only approach to cell-cycle analysis is synchronization, we point out that non-synchrony approaches are equally valid and generally to be preferred. For example, if an unperturbed cell culture is separated out by cell size, and the expression of genes is measured as a function of cell size, one can get an idea of which genes vary in expression during the cell cycle [5, 16]. The finding of a large number of cyclically expressed genes by various groups has been welcomed because this finding fits the widely stated expectations of the field of cell-cycle studies. This expectation has been explicitly described by analogy with building a large structure . As the story goes, it is not a good idea to have all the materials present at the start of the building process. Rather it is more efficient or better to have the materials delivered when they are needed. From this point of view  it is best for the cell to make the needed material when it is about to be used. Thus, one would expect that the genes for initiation of DNA replication would be made at the end of the G1 phase, just in time for initiation of S phase. And the genes for products involved in mitosis would also be made near or at the time of mitosis. A good explanation for a biological phenomenon explains that phenomenon in terms of efficiency and logical order. Thus, the classic story of the inducibility of β-galactosidase is told as an efficiency story, with the cell only making the enzyme when it is needed. If the enzyme were made all the time, the cell would be inefficient in an environment devoid of the substrates of the enzyme. In contrast to the enzyme-induction story, the cell-cycle gene-expression story is not based on as rigorous an empirical foundation. And that is the point we wish to make here. Most of the articles on the use of microarrays start out with the assumption that there are many cyclically expressed genes, and it is the job of the microarray user to identify these genes. We propose that both possibilities should be considered – that there are many and there are few or no cell-cycle regulated genes – in order to approach the data without a preconceived idea as to the nature of the cell cycle. We hope that the apparently unrelenting negative tone of this review of microarray analyses of gene expression during the division cycle serves as a wake-up call to rethink the current view of the cell cycle. There are problems with the synchronization of cells [3, 4, 6, 8, 9]. There are problems with the statistical analysis of microarray data [10–12]. Until both of these areas are dealt with, the mass of data emanating from these studies will be only that – data – and will not have any meaning for our understanding of the regulation of gene expression during the cell cycle. Finally, we suggest that true synchronization methods and a more broadly considered interpretation of the results and extent of cycle-specific gene expression [4, 20, 21] will lead to better experiments and more accurate results.